On Friday, the Education Department rescinded Obama-era guidelines on how universities and colleges address campus sexual assault, putting “interim rules in place,” the AP reports. The policy shift comes two weeks after Education Secretary Betsy DeVos announced her intention to end the “era of rule by letter.” DeVos, who in July met with survivors, university administrators, the wrongfully accused and—most controversially—men’s rights activists, criticized the Obama-era policies as intimidating and coercive in her speech earlier this month. Survivor advocates, who have been expecting the repeal for weeks, say that by undoing the DCL, DeVos is turning backwards. 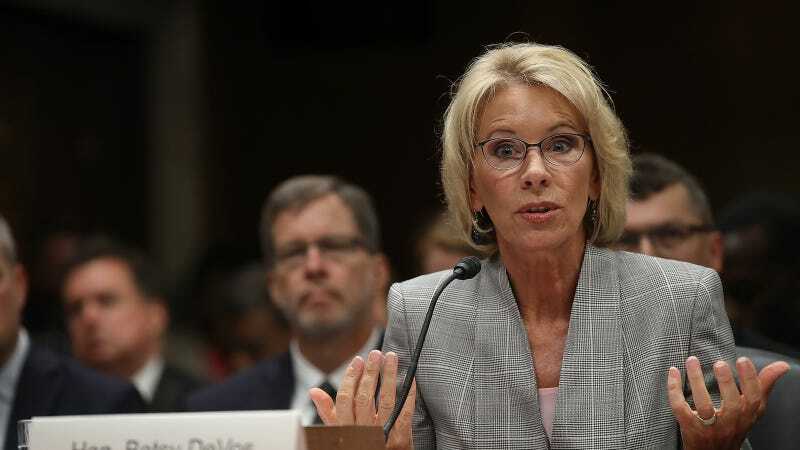 “We are hoping that they’d be willing to work with us on actual worries that survivors have, or actual things that survivors have about Title IX not being upheld on their campuses, and how they can help, but instead we’re just hearing that there are two sides to a story, a narrative that this administration has pushed often when it comes to experiencing violence and oppression,” Know Your IX Manager Sage Carson told Jezebel earlier this month.